Microsoft recently announced its most recent Surface device, the Surface 3, to a bit of fanfare and generally positive previews. 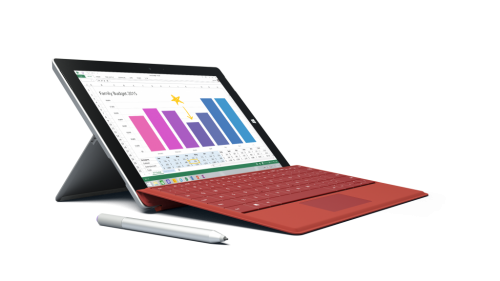 The Surface 3 is the direct replacement for the Surface 2, and serves as a sort of entry-level version of the Surface Pro 3. It uses an Intel Atom processor, can be configured with up to 4GB of RAM and 128GB of SSD storage, has a 10.8″ HD+ 3:2 screen, and offers the same Type Cover and pen experiences as its older and larger sibling. In short, the Surface 3 looks like an excellent machine for anyone who doesn’t need top-of-the-line processor performance. Pricing in general is competitive with, say, Apple’s iPad Air 2, with the entry-level Surface 3 selling for $499 with 2GB of RAM and 64GB of storage (and with a microSD slot for expansion). This compares to the iPad Air 2 at $499.99 with 2GB of RAM and only 16GB of storage (which cannot be expanded and is simply insufficient for real use, in my experience). Given that the Surface 3 runs both touch-based and full Win32 applications (within the limits of the Atom processor in terms of performance, of course), Microsoft’s newest competitor fares well against its competition. 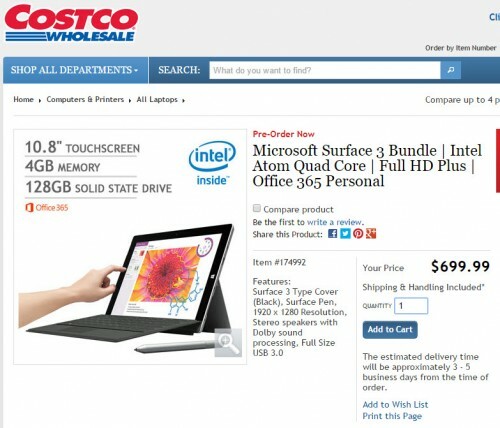 Things get even more interesting with Costco’s pre-order bundle, which is $699.99 for the 4GB/128GB Surface 3, a Type Cover, a pen, and a year’s Office 365 Personal subscription (which comes with the Surface 3 by default). Buy from the Microsoft Store, and you’ll pay $599 + $129.99 for the Type Cover + $59.99 for the pen, or a total of $788.98. That makes Costco’s bundle an excellent deal if you’re a Costco member (and might even be worth paying the $50 to join up), a deal that’s made even sweeter by Costco’s 90-day return policy on electronics. 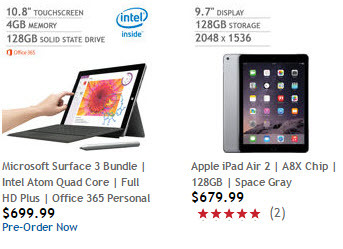 The bundle also raises the question: why would anyone buy an iPad Air 2 when they can get a Surface 3 bundle at essentially the same price? The Surface 3 bundle comes with a keyboard, pen, Office 365 Personal subscription, and 4GB vs. 2GB of RAM, with far more functionality out of the box. If I were Apple, I’d be sweating a bit right now–I still think there’s a place for iPad-style tablets, but that pricing makes the equation a little more challenging for Apple.